In the last post, we saw how to build a simple WPF application using Expression Blend (EB). In this post we’ll add some event handlers to the controls in that application, and in the process bring Visual Studio (VS) into play. You should now see a long list of events that can be generated by this MenuItem. We’re interested in only one: the Click event. Find this event in the list (it should be second from the top), and double-click in the text area for this event. This will create an event handler called menuFileExit_Click (assuming you’ve named the MenuItem menuFileExit as we did in the previous post). If you have told EB to open Visual Studio (VS) to deal with event handling code, VS should now start up and display this bit of code in its C# editor. It may take a while for VS to get going, so be patient at this stage. Note the addition of a ‘Click’ field at the end. This is XAML’s way of adding an event handler to the MenuItem. ‘Application’ is a pre-defined class. Its ‘Current’ field is, not surprisingly, the currently running application, and calling the Shutdown() method will terminate the current application. You can now run the program and shut it down by selecting this menu item. Next, we want to add an event handler for the button. This is done in the same way: in EB, select the button in Objects and Timeline, display its list of events, and double-click the Click event. 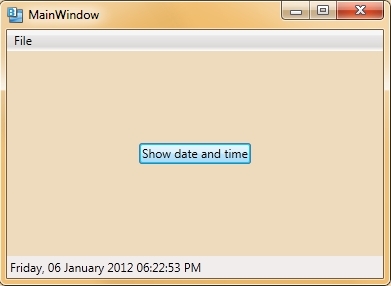 This will take you back to VS, where you can enter the code to display the current date and time in the status bar. That’s all you need to know to write a few simple WPF programs and attach event handlers to them. However, there’s one feature of event handlers that’s worth a mention at this point, even though it’s not something you’ll use all that often. It does, though, give you a bit more insight into how you can deal with event handlers in your own code. Event handlers in .NET are, in technical jargon, multicast delegates. Essentially what this means is that one event can call multiple event handlers. The technique we’ve seen so far allows you call only one handler, so how do you get an event to handle more than one? Despite all the fancy debugging and code tracing tools included in VS, I find a good, simple way of debugging a program is to put output statements at various places in the code so you can see where the program is going as it runs. In order to do this in VS, a simple way is to make the program a “Console application” so you get one of those little black console windows appearing alongside the GUI window. To do this in VS, (assuming your project is called DateTimeApp) open the Project menu and click on the last item in this menu, named “DateTimeApp properties”. In the window that appears, change the Output type to “Console Application” and then run your program again. You’ll now get a console alongside the main window. When you’re done debugging, just switch the Output type back to “Windows Application” to get rid of the console window. Console.WriteLine() just prints the string to the console. // Insert code required on object creation below this point. You can see that the += operator is used to add another event handler to buttonDateTime’s Click event. Be sure to put this code after the call to InitializeComponent(); otherwise buttonDateTime won’t be created and you’ll get a null reference error. If you now run the program and then click the button, you’ll see that the date is updated in the status bar and a message is printed in the console. This demonstrates that you can add event handlers in both the XAML and C# sections of the code.